AMTECH offers Cast Steel -Y type Strainer -150# and 300# in CS ASTMA 216 GR WCB/ Forged Carbon Steel A 105/Cast iron Casting- Y type strainers for all industrial and water lines filter applications. Body of strainer is one pc design casting ,the strainer jail/element made from SS 304 or SS 316 or any suitable material and mesh size. 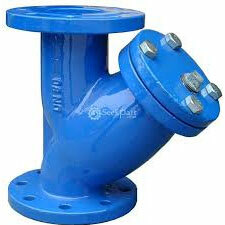 We also provide double strainer element for fine filtrations. We have other filters like conical strainer and basket strainers etc. We can fabricate any special filter as per Drawing.We have Y strainer Sizes range from 1/2" to 12" in flanged end connections.We can provide additional Drain plug as per customer request.